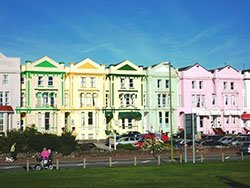 For a traditional family seaside holiday, Paignton, the central English Riviera resort, cannot be beaten. 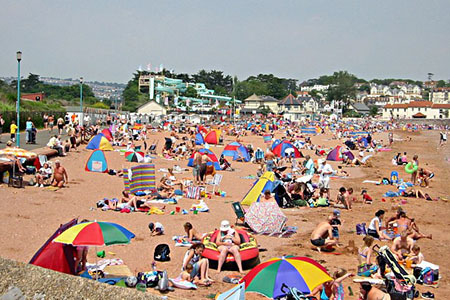 Superb family safe beach holidays and an excellent base for a Devon touring holiday. There are lovely long sandy beaches with shallow water for the little ones and adults who love to paddle. Bucket and spade heaven. The long sandy beach with the pier. Swimming is safe, with care of course. Kiosks for ice creams, cafes for a coffee. There are deck chairs and sun beds available. Pedaloes for some fun. A large grassy green is available as an alternative to the beach. Access is easy and there is ample parking. One problem, Rover will have to stay at home as dogs are banned. European Blue Flag which says it all. Only the very best beaches get one of those. Major award. Long sandy beach with a promenade and a green behind. Hire a beach hut, some deck chairs and/or a sun bed. Check out the pedaloes and boats for hire. Swimming is safe with care. Beach shop for the sun cream or to replace that broken spade. Cafe for the hungry or thirsty. Access is good and there is ample parking. Dogs are not allowed on the beach. Another European Blue Flag Beach. Attractions in front of you, attractions behind you. The long sandy beach has excellent low tide rock pooling. Dogs are only allowed on North Sands. Swimming is safe with care. Beach huts, deck chairs and sun beds can be hired as can pedaloes. Plenty of kiosks for ice creams and a drink. Sit outside of the Inn on the Quay, admire the view and have a long cooling drink. Family friendly. Visit the Seashore Centre behind the beach to find out what is in those intriguing rock pools on the beach at low tide. Quaywest Water Park behind the beach – a large funfilled water playground. Suitable for 'kids' of all ages. From rides for thrill seekers to water fun for toddlers. Swimming pool, cafe, shop. Day and season tickets available as well as straight admission prices. Youngs Park, a pleasant scenic park with a central pond area – a habitat for wild birds, geese and swans. Ideal family picnic area. Another lovely long sandy beach. Beach huts can be hired as can deck chairs and sun beds. Swimming is safe with care. There is a cafe and a beach shop. Access is not difficult but parking is somewhat limited. Dogs are not allowed on the beach. If you prefer a pretty shingle beach this one is for you. A favourite with water skiers. Access is along a footpath from Broadsands car park. The nearest cafe and toilets are at Broadsands as well. Woodlands walks are popular and as the dog can come along as well, this one can be ideal. There are not that many of the old style seaside piers around now, but this seaside resort has one. 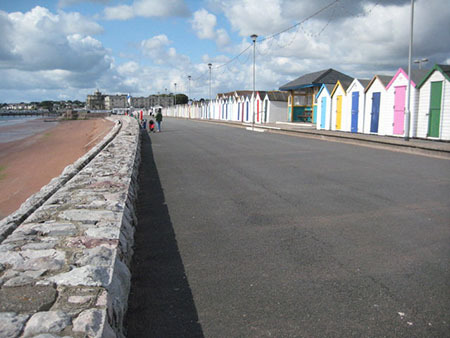 It is right in the middle of one of Torbay's best beaches, Paignton Beach, and not far from the town centre. Colourful, lively with plenty of amusements, cafe's and kiosks. Fish and chips ar not bad either. Open all year – and why not – winter is not long here and there are days when the weather may be cool, but it is bright and sunny. Walk along the pier for magnificent views of Torbay summer or winter. 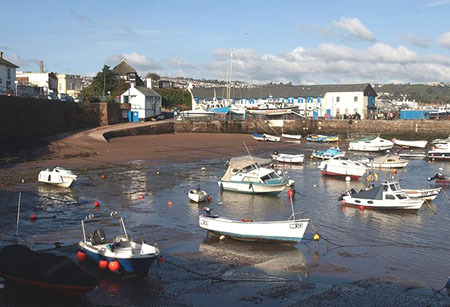 Placed between Goodrington Beach and Paignton Beach is the Harbour, about one and half miles from the town centre. A boat trip to Torquay or Brixham – now and again a dolphin can be seen. Walks round the harbour to Roundham Point – one is wheelchair friendly, while another goes over the head with the resultant delight of great views. There are restaurants, cafes and kiosks at the harbour. How could one not have a sun and sea holiday in this beautiful town. Plenty of holiday haunts available. Some really nice ones. A hotel perhaps, self catering maybe, quite handy where there are kids. Or what about a lovely cottage in the Devon countryside? Check out the top of the righthand column for some pretty good ideas. Did you ever watch “Meerkat Manor”? There are real live meerkats at Paignton Zoo. At one time during its millions of years of history Torbay was itself in the middle of a desert, that red Devon soil is a giveaway. As the continents moved apart Torbay moved north. Now modern animals that live in the desert today, the tropics and the savannah can perhaps be seen living in Paignton Zoo. An amazing place. If you enjoy this Zoo pop over to Torquay and look in at Living Coasts, a sister attraction. Watch penguins, seals and sea birds. 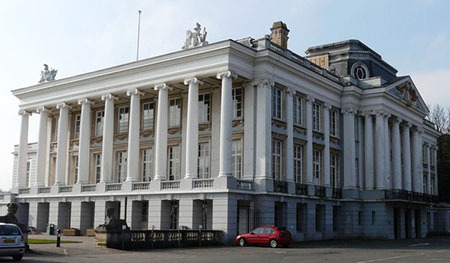 Situated in Cecil Road, Kirkham House is owned by English Heritage. Not a bad place to be on a hot day as the house seems to remain cool in the summer. 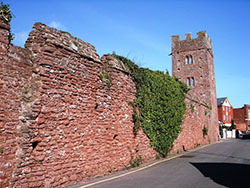 Kirkham is a medieval house built probably in the fourteenth century. However the house is only open at certain times and a check should be made with English Heritage for current visiting times. Oldway is a Grade II listed building set in seventeen acres of lovely gardens, once owned by the Singer family of sewing machine fame. Isaac Merrit Singer built the mansion and his third son Paris Singer rebuilt it and modelled it on The Palace of Versailes and the Place de la Concorde both of course in France. In consequence it is a spectacular venue with staircase and gallery built in marble and bronze and marble pillars. If you have ever been to the Palace of Versailles – imagine a miniature version of the Hall of Mirrors and that is Oldway's Gallery. Guided Tours are available. There is a cafe if you fancy a cuppa. A really pleasant day trip - six and a half miles of heritage railway from the town to Kingswear and then by ferry to Dartmouth. Superb scenery. What about a boat trip at Dartmouth? Or why not get a cruise to Totnes and then back to Paignton by open top bus if it is a nice day. Round Robin Service. Kids would love it. Combine it with a picnic perhaps. Located at Marldon a few miles inland from Paignton. A real fortified house almost unaltered from sixteenth century. It was originally built in the fourteenth century. During the reign of Henry VIII there were threats of invasion from France and so the Gilbert family who owned the castle fortified it. The Gilberts were important folk during the sixteenth century. Sir Humprey Gilbert colonised Newfoundland and others were mainstays of Elizabethan naval defence. Sir Walter Raleigh was Sir Humphrey Gilbert's younger half brother. Now owned by the National Trust. The Great kitchen was a central part of the domestic organisation of a castle and at Compton it is a good example. Or you might like to browse some more, please do, there are navigation buttons above on the left.